She is lithe and sprightly, still wears youth on her shoulders like a gossamer cloak. She hovers just slightly taller than the rest of her family, and heavier, too, packed with muscle in all the places that Bexley might not be, wide-shouldered and powerful. A dozen dorsal stripes run stark white down the coarse of her spine. Angharad is cloaked in dusky browns and golds, darkening at her back and forelegs, lightening to a pearlescent white across her neck and barrel; like a wild animal, thick black markings stripe their way over the girl’s back legs and drip down from her Briar-blue eyes. Angharad’s hair flows far longer than a normal horses, drifting past her legs and onto the ground. 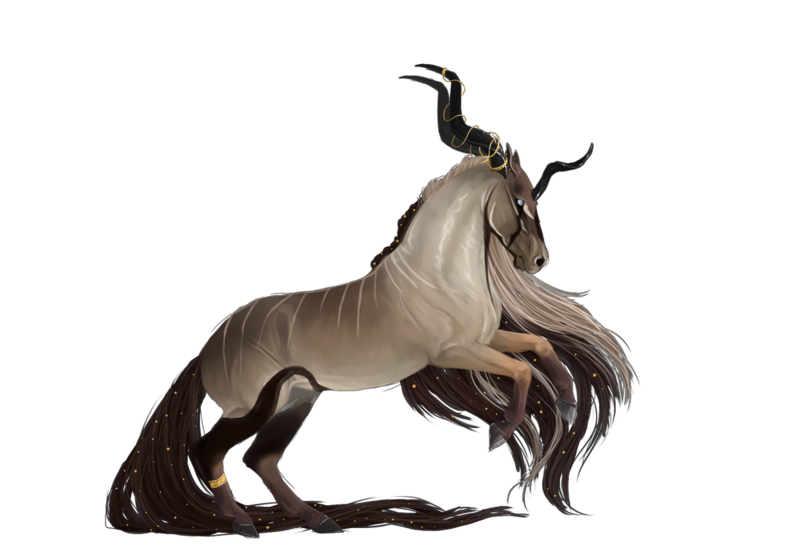 Her tail is a deep chocolate brown streaked with gold, and her mane is the same but for the chunk of hair toward her skull that has gone absolutely white, losing all color and hue. From just behind her ears spiral two huge kudu horns, pitch black and at least a foot in length. A third grows slightly shorter from the center of her forehead. The two behind her ears are always laced with a spit-thin thread of gold hooked at the top and bottom, and an anklet made of the same shining metal lies tight around her back right leg. In the vein of the rest of her family, Angharad is a thing to be feared - but her buttons are much harder to push than the rest of the Briars’. Generally she is sociable and quick to make friends, not stupid, not really, but often too trusting of other’s good intentions. Flirtatious and charming, Angharad’s reservations about friendliness are negligible, if they exist at all; rarely is she seen without a smirk, and she’ll go out of her way to strike up a conversation with anyone she sees. Energy flows through her constantly. Whether it’s her young age or an ingrained personality trait remains to be seen, but Angharad almost never falters in her overexcitement and enthusiasm about the vastness of the world, and what it might offer her. But with her youth and her excitement come a whole host of teenage flaws - impatience, pettiness, immaturity. With Una’s voice rolling constantly in the back of her head, Angharad is mostly well-practiced at keeping her head down and her anger stifled, but when it does break the surface, her frustration is only the petulant whine of an overgrown child, bratty and self-absorbed, and while Angharad is content to follow the path her grandmother has marked for her most of the time, anyone who crosses her will face the wrath of a toddler having a temper tantrum, spiteful and contentious. Angharad’s moral compass, though, is stronger than the rest of her family’s. Obedient though she is to Una and the Briar line, she has a deep empathy for the people around her, especially girls her age, and will help anyone as much as she is feasibly able. Cool-headed and good-humored, Angharad does not quite think of herself as a prophet, the way her family sees her, nor as a child, as the rest of the world might - she bends generally to the will of whoever is ruling over her, and tries not to think about her own submissiveness too much. There was the Earth, and then there was Una. Even Angharad, late as she was born in this timeline, knows that much. By the time she crawled from Lazslo’s body like a maggot from a carcass their homeland was already in a state of disaster. Smoke sang from so many forest fires, bushes were trampled to their roots in the dirt, bodies lay slack-jawed and limp, one on top of the other. Anyone else would have been traumatized. Or at least terribly frightened. For Angharad, though, born from guts and blood, literally - Angharad, who had lived her whole prenatal existence as only the thought of life, nestled by a beating heart - the scenery was disturbing in the same way it is disturbing to see a swatted fly. Barely. Una was waiting. She watched Angharad, then nameless, and covered in blood, burst her way from between Laszlo’s ribs and take a first panting breath of the smog-filled air. She watched with huge eyes bright like moons, wraith-like, simmering against a background of catastrophe, and told the child her name, calmly: you are Angharad David Briar. Angharad accepted this, as she would come to accept everything else Una told her. At that time Una had not been seen by real eyes for hundreds of years, except by her immediate children. All of Greer-Briar had come to accept that their namesake had died, or fled, or simply grown tired of mortal squabbles and returned to her place in the woods where she would sleep for another eon or two, covered in moss and flowers and dew. She was, effectively, a ghost. For Angharad to see her on her first day alive would be the holiest of all miracles, if it were not for the inherent unholiness of the situation that had come to pass in Greer-Briar. They walked the grounds, girl and ghost together. For hours and hours - or maybe even days, who was to say? Una told her prodigy about what had happened and who she was, created by Una herself from her grandchild’s rib, a thing of blacks and tans and blood with one purpose, one purpose only. Find Bexley, she said. Your aunt. Greer-Briar will suffer until she returns because she is the last true Briar left alive, coward though she is. What if she doesn’t want to come back? Make her. Tell her I sent you. She has no choice. So Angharad, black and tan and blood, horns spiraling from her forehead, sharp-eyed, wild, followed the path Una marked for her. DISCIPULI - Angharad does not know, really, what her powers encompass. What she knows is this: around her, dead things do not stay dead for long. Shriveled plants grow new leaves, scattered bones might knit themselves back into skeletons, crushed bugs regain their shells and skitter into the forest. But as soon as she turns her attention from one thing to the next, or strays too far from the bounds of what was previously lifeless, her influence disappears and everything falls deceased again. VEXILLUM - The things she raises from the dead are bigger now - small animals, birds, snakes. She can direct her focus to one area and has finally realized what, exactly, she is capable of. But the larger that animal the more effort it takes, and her scope of control still wavers as soon as she is out of sight of the object of her attention. Nothing stays alive longer than fifteen or twenty minutes once she turns her focus away from it. PERITI - Angharad’s control is more stable and lasts longer; smaller animals will often remain alive for an hour or two after she leaves the scene, and she can direct her attention to one thing at a time, rather than any multitude of organisms around her. Plants spring up wherever she walks, unrolling from the dirt. Angharad might temporarily bring another horse back to life or communicate with them much like a medium would, but only for minutes at a time; it is extremely taxing. DOMINUS - Her control over the dead can be applied to any living thing, though more effort is required in relation to the complexity of the organism. Smaller plants and animals will remain alive indefinitely after she leaves. She can reach out to the dead more easily and for longer periods of time and has complete control over what she raises and kills again, and can even create new life out of old - bones, corpses, plant matter. Gold studs in right ear; gold cuff on back right leg; gold string wrapped around her horns.